That time I ran a race. For reals. I ran the race of my life, and I’m here to tell you about it! Okay, so before you get too excited, it was only a 5k, but for a lifelong non-runner asthmatic like moi, it was kind of a big deal :). 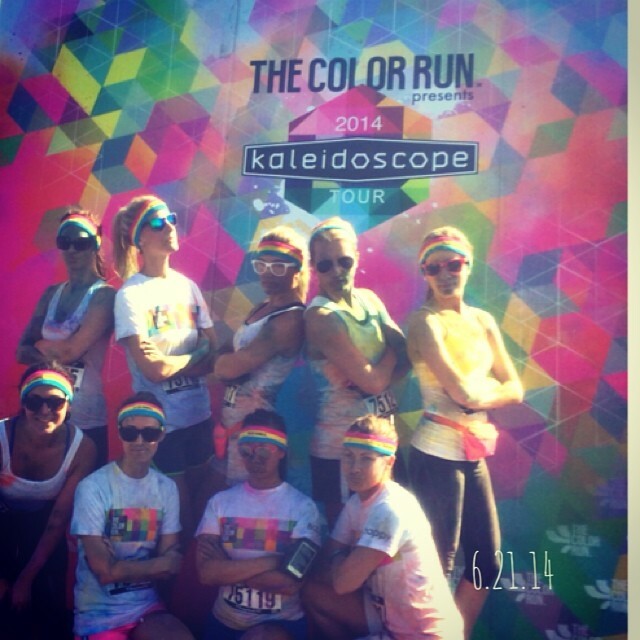 It all began when a fellow non-runner friend of mine came up with the brilliant idea of doing a color run. 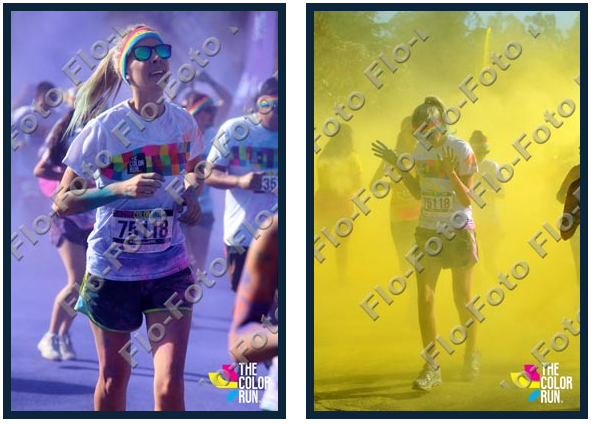 I looked at the photos of people covered in neon chalk and dancing and thought hey even I can handle that. So I went for it. It was super easy to sign up for something months away, and the panic didn’t set in until about a month before the race. I realized that a) I hadn’t run in six + months, and b) I had never ran over three miles before. AND our little non-runner group of friends expanded to include some of our marathon running amigas. As in one of the girls on our team ran the Boston Marathon. Twice! And for the record there was one piece of running I did like and was super good at- carbo loading. Yup, nailed it. Just kidding. Kind of. It’s been far far too long since I last blogged. Excuses? Many. Good ones? A few. But instead of mourning lost time, let’s move on to something more exciting, like- Birthday Week! Yes, I like many of my female counterparts, have decided that one day is just not enough to celebrate our awesomeness, and thus birthday week was born. Steve is a good sport about it and puts up with my half joking/half absolutely serious whims and birthday demands. So yeah, I’ve been eating a lot of candy and having a lot of fun this week! On my actual birthday Steve and some friends suprised me at one of my favorite brunch spots in Santa Monica, Sonoma wine garden. To be honest I don’t even love the food that much- they don’t have very many gluten free options. BUT the mimosas you guys, these things are vats! Most bottomless mimosa places give you teeny glasses and you have to literally tackle the waitress for a refill. At SWG you have to turn down refills at some point or request a wheel chair. My kinda place! And the atmosphere is equally amazing. Great sunny rooftop just two blocks off the ocean. So we had an amazing and boozy brunch to start the day. After brunching it up Steve took me to trapeze school!!! It’s been on my summer list and I was so excited that he took the initiative to plan it and surprise me. Maybe a little too much of a surprise based on the mimosas I had. Was a little worried it would affect my coordination. Turns out having a few was probably a great way to loosen up- I wasn’t scared to leap off the ledge and jump right into it. Literally :). I’ll share more on trapeze when I do my summer list review. Right now I’m going to go grab a glass of wine. It is birthday week. a very important to do list! I’m taking a summer vacation from my monthly resolutions and switching it up with my second annual Summer To Do List! It’s a little way to bring back some of the joy of summer, even if us adults don’t get three months off of work (sigh). The idea is to make a fun to do list. 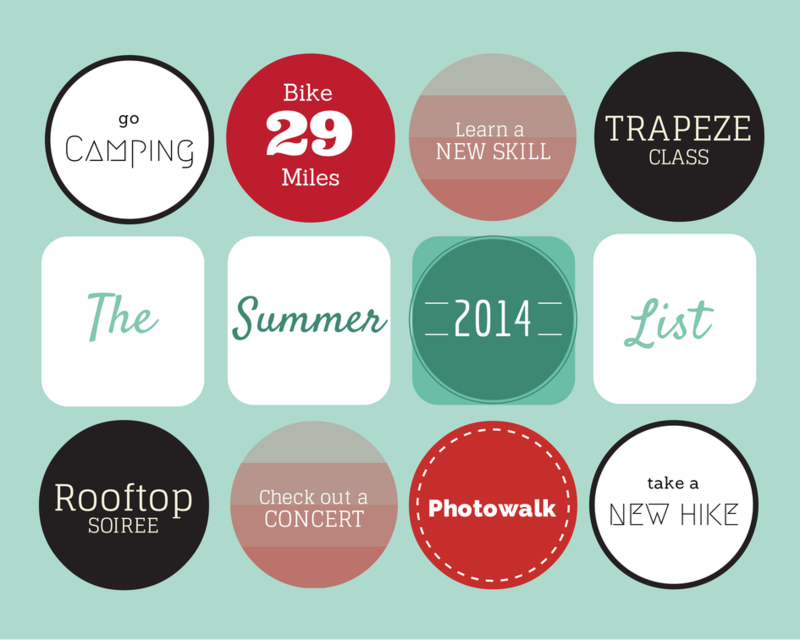 One that has awesome summer activities on it instead of chores or other boring stuff that usually occupy to do lists. Last year I did the list mostly with friends which was fabulous. This year I’m changing it up a bit and Steve and I are taking on the list together. Not necessarily exclusive of other people, but always together. Might be a newly engaged thing, but I can’t get enough of that guy! So we took some paper and wine to our rooftop deck and dreamed up some fun summer adventures. Some are easy- going on a photo walk or a hike, and some require a little more planning. I think it’s a good mix, and hopefully we can get through them all! And because this is supposed to be a fun list, I ditched the usual format and went for something more visual. As we complete each item we can change the badge out for a photo of the activity. The circles kind of remind me of girl scout badges! What’s on your summer to do list? Enjoying life's sweetness in Los Angeles. This blog is about the things I Iove including candy, clothes, and crafting. Thanks for stopping by!